or example, with Puget Sound salmon recovery, managers are asking how climate change will alter various rivers’ temperatures, flow levels and nutrient content. Because salmon recovery includes individual species, entire populations and the surrounding ecosystem, many resilience attributes are being used to monitor the status of the fish and recovery of the river ecosystems that support them. Last November’s magnitude 7.8 Kaikoura earthquake in New Zealand was so complex and unusual, it is likely to change how scientists think about earthquake hazards in plate boundary zones around the world, finds a new international study. “This complex earthquake defies many conventional assumptions about the degree to which earthquake ruptures are controlled by individual faults, and provides additional motivation to re-think these issues in seismic hazard models,” Hamling says. The research team included 29 co-authors from 11 national and international institutes. To conduct the study, they combined multiple datasets, including satellite radar interferometry and GPS data that measure the amount of ground movement associated with the earthquake, along with field observations and coastal uplift data. The team found that parts of New Zealand’s South Island moved more than 16 feet (5 meters) closer to New Zealand’s North Island and were uplifted by as much as 26 feet (8 meters). The largest movement during the earthquake occurred on the Kekerengu fault, where pieces of Earth’s crust were displaced relative to each other by up to 82 feet (25 meters), at a depth of about 9 miles (15 kilometers). Maximum rupture at the surface was measured at 39 feet (12 meters) of horizontal displacement. The scientists analyzed interferometric synthetic aperture radar (InSAR) data from the Copernicus Sentinel-1A and -1B satellites, which are operated by the European Space Agency, along with InSAR data from the Japan Aerospace Exploration Agency’s ALOS-2 satellite. They compared pre- and post-earthquake images of Earth’s surface to measure land movement across large areas and infer movement on faults at depth. The Sentinel and ALOS-2 satellites orbit Earth in near-polar orbits at altitudes of 373 and 434 miles (600 and 700 kilometers), respectively, and image the same point on Earth at repeat intervals ranging from six to 30 days. The Sentinel and ALOS-2 satellites use different wavelengths, which means they pick up different aspects of surface deformation, adding to the precision and completeness of the investigation. Before the earthquake, coauthors Cunren Liang and Eric Fielding of NASA’s Jet Propulsion Laboratory, Pasadena, California, developed new InSAR data processing techniques to measure the ground deformation in the satellite flight direction using wide-swath images acquired by the ALOS-2 satellite. This is the first time this new approach has been successfully used in earthquake research. Engineers have designed a microfluidic device they call a “tree-on-a-chip,” which mimics the pumping mechanism of trees and other plants. Like its natural counterparts, the chip operates passively, requiring no moving parts or external pumps. It is able to pump water and sugars through the chip at a steady flow rate for several days. 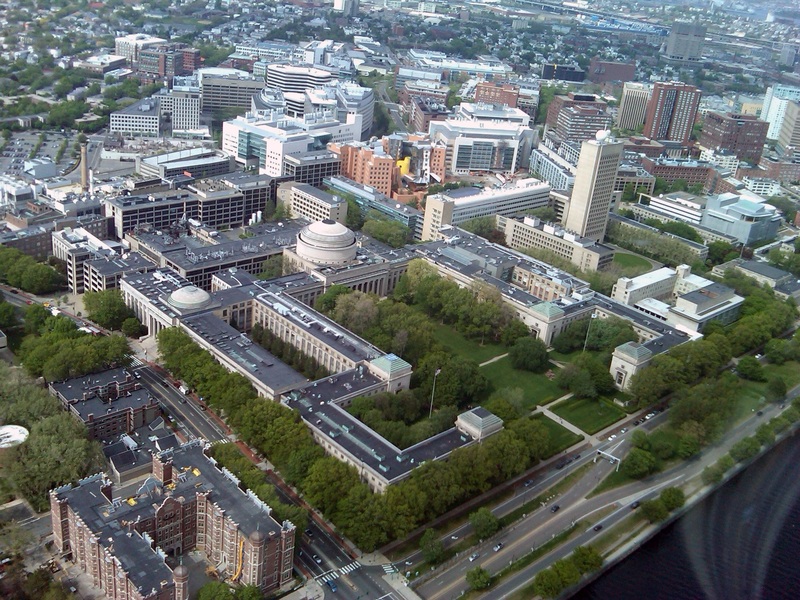 Now engineers at MIT and their collaborators have designed a microfluidic device they call a “tree-on-a-chip,” which mimics the pumping mechanism of trees and plants. Like its natural counterparts, the chip operates passively, requiring no moving parts or external pumps. It is able to pump water and sugars through the chip at a steady flow rate for several days. The results are published this week in Nature Plants. 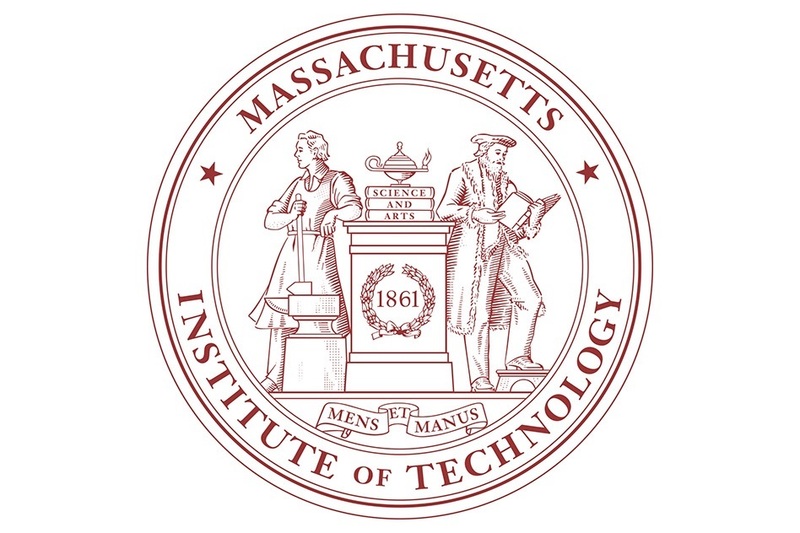 Anette “Peko” Hosoi, professor and associate department head for operations in MIT’s Department of Mechanical Engineering, says the chip’s passive pumping may be leveraged as a simple hydraulic actuator for small robots. Engineers have found it difficult and expensive to make tiny, movable parts and pumps to power complex movements in small robots. The team’s new pumping mechanism may enable robots whose motions are propelled by inexpensive, sugar-powered pumps. 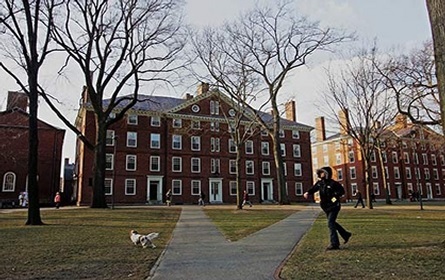 Hosoi’s co-authors on the paper are lead author Jean Comtet, a former graduate student in MIT’s Department of Mechanical Engineering; Kaare Jensen of the Technical University of Denmark; and Robert Turgeon and Abraham Stroock, both of Cornell University. The group’s tree-inspired work grew out of a project on hydraulic robots powered by pumping fluids. Hosoi was interested in designing hydraulic robots at the small scale, that could perform actions similar to much bigger robots like Boston Dynamic’s Big Dog, a four-legged, Saint Bernard-sized robot that runs and jumps over rough terrain, powered by hydraulic actuators. The general understanding among biologists has been that water, propelled by surface tension, travels up a tree’s channels of xylem, then diffuses through a semipermeable membrane and down into channels of phloem that contain sugar and other nutrients. It was Hosoi’s student Comtet who identified a third essential part to a tree’s pumping system: its leaves, which produce sugars through photosynthesis. Comtet’s model includes this additional source of sugars that diffuse from the leaves into a plant’s phloem, increasing the sugar-to-water gradient, which in turn maintains a constant osmotic pressure, circulating water and nutrients continuously throughout a tree. 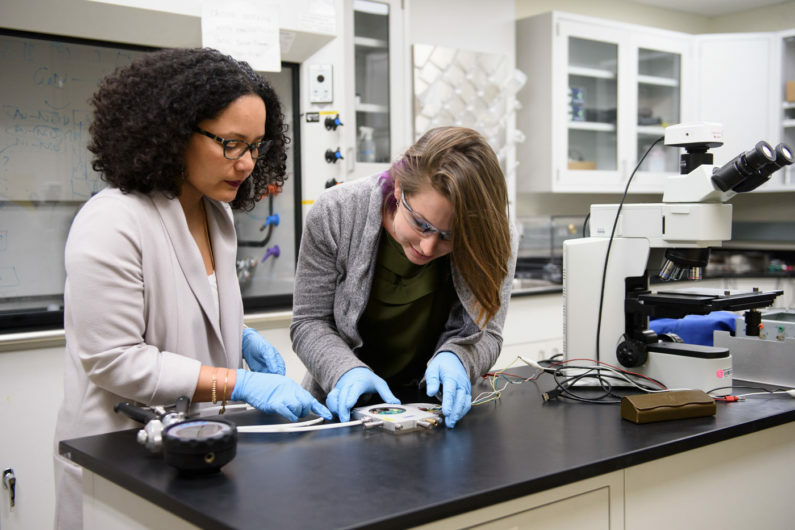 With Comtet’s hypothesis in mind, Hosoi and her team designed their tree-on-a-chip, a microfluidic pump that mimics a tree’s xylem, phloem, and most importantly, its sugar-producing leaves. To make the chip, the researchers sandwiched together two plastic slides, through which they drilled small channels to represent xylem and phloem. They filled the xylem channel with water, and the phloem channel with water and sugar, then separated the two slides with a semipermeable material to mimic the membrane between xylem and phloem. They placed another membrane over the slide containing the phloem channel, and set a sugar cube on top to represent the additional source of sugar diffusing from a tree’s leaves into the phloem. They hooked the chip up to a tube, which fed water from a tank into the chip. “If you design your robot in a smart way, you could absolutely stick a sugar cube on it and let it go,” Hosoi says. This research was supported, in part, by the Defense Advance Research Projects Agency. Brookhaven’s high-energy proton accelerator and a group led by Cathy Cutler team up to meet the nation’s demand for medical isotopes. 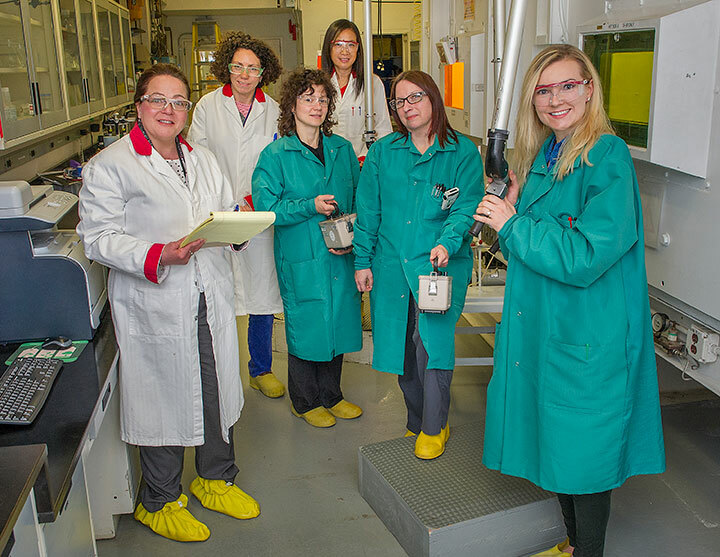 Cathy Cutler, Lisa Muench, Tatjana Klaric, Weimin Zhou, Vicky Litton, and Anna Goldberg in the hot cell area where BLIP targets are processed to extract desired isotope products. The before and after images are stunning: A prostate cancer patient riddled with metastatic tumors that disappear after just three, potent treatments. “Two patients underwent these treatments and they were cured,” said Cathy Cutler, director of the Medical Isotope Research and Production Program at the U.S. Department of Energy’s Brookhaven National Laboratory. “Their cancer was gone. “This is what we want to do—supply this material so that more patients can get this treatment,” she said. Medical applications of isotopes produced at BLIP Top: BLIP produces Strontium-82, a relatively stable isotope that can be transported and used in hospitals to generate Rubidium-82, a radiotracer that reveals reduced blood flow in heart muscle under stress. This precision scanning points physicians to coronary arteries that need treatment. Credit: Washington University School of Medicine. 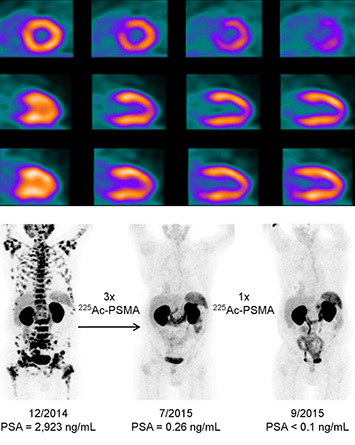 Bottom: Before and after images show how a molecule labeled with Actinium-225 delivers cell-killing alpha particles directly to tumors, eradicating metastatic prostate cancer. The BLIP team aims to increase the production of Ac-225 so scientists can conduct large-scale trials and get this potentially lifesaving treatment to more patients. Credit: ©SNMMI: C. Kratochwil. J. Nucl. Med., 2016; 57 (12); 1941. The material is a molecule tagged with Actinium-225, a radioactive isotope. When designed to specifically bind with a protein on the surface of cancer cells, the radiolabeled molecule delivers a lethal, localized punch—alpha particles that kill the cancer with minimal damage to surrounding tissues. Actinium-225 can only be produced in the large quantities needed to support clinical applications at facilities that have high-energy particle accelerators. 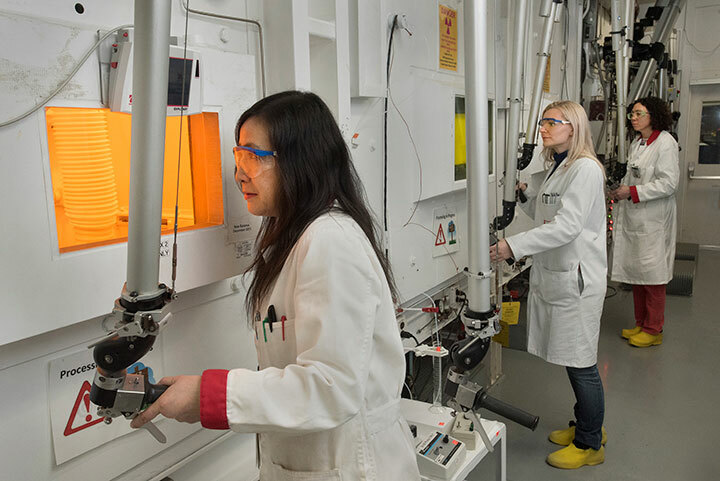 Brookhaven Lab and the Department of Energy Isotope Program have a long history of developing radioisotopes for uses in medicine and other applications. These radioactive forms of chemical elements can be used alone or attached to a variety of molecules to track and target disease. “If it wasn’t for the U.S. Department of Energy and its isotope development program, I’m not sure we’d have nuclear medicine,” Cutler said. Among the notable Brookhaven Lab successes are the development in the 1950s and 60s, respectively, of the Technetium-99m generator and a radioactively labeled form of glucose known as 18FDG—two radiotracers that went on to revolutionize medical imaging. As an example, 18FDG emits positrons (positively charged cousins of electrons) that can be picked up by a positron emission tomography (PET) scanner. Because rapidly growing cancer cells take up glucose faster than healthy tissue, doctors can use PET and 18FDG to detect and monitor the disease. While Tc-99m and 18FDG are now widely available in hospital settings and used in millions of scans a year, other isotopes are harder to make. 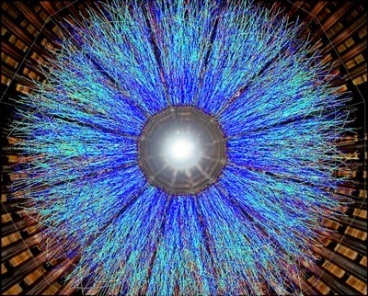 They require the kind of high-energy particle accelerator you can find only at world-class physics labs. “Brookhaven is one of just a few facilities in the DOE Isotope Program that can produce certain critical medical isotopes,” Cutler said. Brookhaven’s linear accelerator (“linac”) was designed to feed beams of energetic protons into physics experiments at the Relativistic Heavy Ion Collider (RHIC), where physicists are exploring the properties of the fundamental building blocks of matter and the forces through which they interact. The Solenoidal Tracker at the Relativistic Heavy Ion Collider (RHIC) is a detector which specializes in tracking the thousands of particles produced by each ion collision at RHIC. Weighing 1,200 tons and as large as a house, STAR is a massive detector. 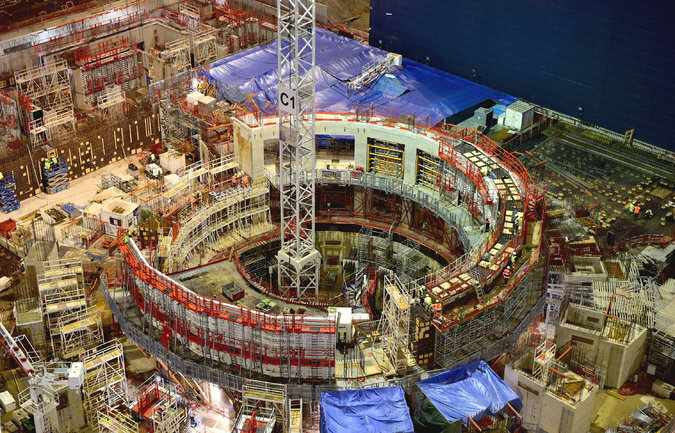 It is used to search for signatures of the form of matter that RHIC was designed to create: the quark-gluon plasma. It is also used to investigate the behavior of matter at high energy densities by making measurements over a large area. | Photo courtesy of Brookhaven National Lab. But because the linac produces the protons in pulses, Cutler explained, it can deliver them pulse-by-pulse to different facilities. Operators in Brookhaven’s Collider-Accelerator Department deliver alternating pulses to RHIC and the Brookhaven Linac Isotope Producer (BLIP). BLIP operators aim the precisely controlled beams of energetic protons at small puck-shaped targets. The protons knock subatomic particles from the targets’ atoms, transforming them into the desired radioactive elements. 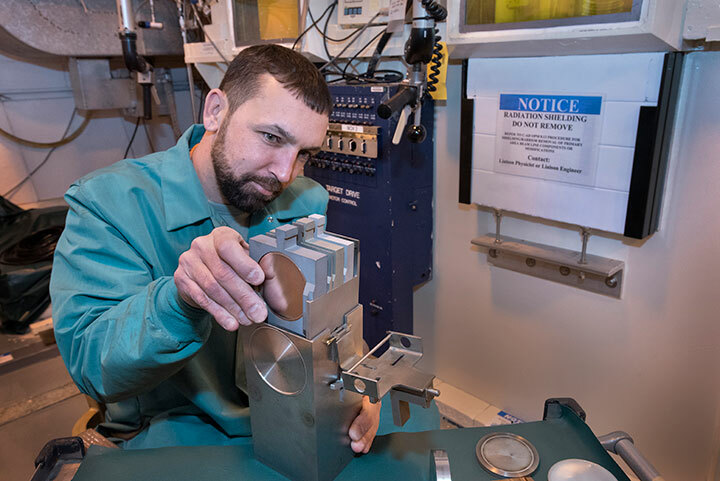 “We stack different targets sequentially to make use of the beam’s reduced energy as it exits one target and enters the next in line, so we can produce multiple radionuclides at once,” Cutler said. Transformed targets undergo further chemical processing to yield a pure product that can be injected into patients, or a precursor chemical that can easily be transformed into the desired isotope or tracer on site at a hospital. Cutler recently oversaw installation of a new “beam raster” system designed to maximize the use of target materials and increase radioisotope production. 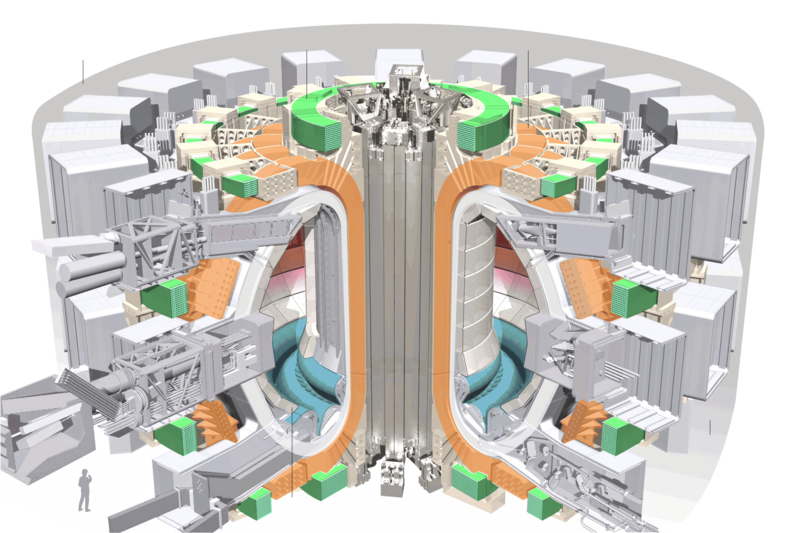 With this upgrade, a series of magnets steers BLIP’s energetic particle beam to “paint” the target, rather than depositing all the energy in one spot. This cuts down on the buildup of target-damaging heat, allowing operators to increase beam current and transform more target material into the desired product. The new raster system and ramped up current helped increase production of one of BLIP’s main products, Strontium-82, by more than 50 percent in 2016. Sr-82 has a relatively long half-life, allowing it to be transported to hospitals in a form that can generate a short-lived radiotracer, Rubidium-82, which has greatly improved the precision of cardiac imaging. Weimin Zhou, Anna Goldberg, and Lisa Muench in the isotope-processing area. BLIP also produces several isotopes with improved capabilities for detecting cancer, including metastatic tumors, and monitoring response to treatment. But rising to meet the demand for isotopes that have the potential to cure cancer may be BLIP’s highest calling—and has been a key driver of Cutler’s career. Radionuclides that emit alpha particles are among the most promising isotopes because alpha particles deliver a lot of energy and traverse very small distances. Targeted delivery of alphas would deposit very high doses—“like driving an 80-ton semi truck into a tumor”—while minimizing damage to surrounding healthy cells, Cutler said. One experimental treatment Cutler developed using Lutetium-177 while still at the University of Missouri worked favorably in treating neuroendocrine tumors, but didn’t get to a cure state. Actinium-225, one of the isotopes that is trickier to make, has shown more promise—as demonstrated by the prostate cancer results published in 2016 by researchers at University Hospital Heidelberg. Right now, according to Cutler, DOE’s Oak Ridge National Laboratory (ORNL) makes enough Ac-225 to treat about 50 patients each year. But almost 30 times that much is needed to conduct the clinical trials required to prove that such a strategy works before it can move from the laboratory to medical practice. “With the accelerator we have here at Brookhaven, the expertise in radiochemistry, and experience producing isotopes for medical applications, we—together with partners at ORNL and DOE’s Los Alamos National Laboratory—are looking to meet this unmet need to get this material out to patients,” Cutler said. The work at BLIP is funded by the DOE Isotope Program, managed by the Office of Science’s Nuclear Physics program. RHIC is a DOE Office of Science User Facility. Two fast ageing mice. The one on the left was treated with a FOXO4 peptide, which targets senescent cells and leads to hair regrowth in 10 days. The day we pop up a pill or get a jab to stave off ageing is closer, thanks to two high profile papers just published today. A Science paper from a team, led by David Sinclair from Harvard Medical School and the University of NSW, shows how popping a pill that raises the levels of a natural molecule called nicotinamide adenine dinucleotide (NAD+) staves off the DNA damage that leads to aging. The other paper, published in Cell, led by Peter de Keizer’s group at Erasmus University in the Netherlands, shows how a short course of injections to kill off defunct “senescent cells” reversed kidney damage, hair loss and muscle weakness in aged mice. Taken together, the two reports give a glimpse of how future medications might work together to forestall ageing when we are young, and delete damaged cells as we grow old. “This is what we in the field are planning”, says Sinclair. Sinclair has been searching for factors that might slow the clock of ageing for decades. His group stumbled upon the remarkable effects of NAD+ in the course of studying powerful anti-ageing molecules known as sirtuins, a family of seven proteins that mastermind a suite of anti-ageing mechanisms, including protecting DNA and proteins. Resveratrol, a compound found in red wine, stimulates their activity. But back in 2000, Sinclair’s then boss Lenny Guarente at MIT discovered a far more powerful activator of sirtuins – NAD+. It was a big surprise. “It would have to be the most boring molecule in the world”, notes Sinclair. It was regarded as so common and boring that no-one thought it could play a role in something as profound as tweaking the ageing clock. But Sinclair found that NAD+ levels decline with age. “By the time you’re 50, the levels are halved,” he notes. And in 2013, his group showed [Cell] that raising NAD+ levels in old mice restored the performance of their cellular power plants, mitochondria. One of the key findings of the Science paper is identifying the mechanism by which NAD+ improves the ability to repair DNA. It acts like a basketball defence, staying on the back of a troublesome protein called DBC1 to keep it away from the key player PARP1– a protein that repairs DNA. When NAD+ levels fall, DBC1 tackles PARP1. End result: DNA damage goes unrepaired and the cell ‘ages’. “We ‘ve discovered the reason why DNA repair declines as we get older. After 100 years that’s exciting,” says Sinclair . His group has helped developed a compound, nicotinamide mono nucleotide (NMN), that raises NAD+ levels. As reported in the Science paper, when injected into aged mice it restored the ability of their liver cells to repair DNA damage. In young mice that had been exposed to DNA-damaging radiation, it also boosted their ability to repair it. The effects were seen within a week of the injection. These kinds of results have impressed NASA. The organisation is looking for methods to protect its astronauts from radiation damage during their one-year trip to Mars. Last December it hosted a competition for the best method of preventing that damage. Out of 300 entries, Sinclair’s group won. As well as astronauts, children who have undergone radiation therapy for cancer might also benefit from this treatment. According to Sinclair, clinical trials for NMN should begin in six months. While many claims have been made for NAD+ to date, and compounds are being sold to raise its levels, this will be the first clinical trial, says Sinclair. By boosting rates of DNA repair, Sinclair’s drug holds the hope of slowing down the ageing process itself. 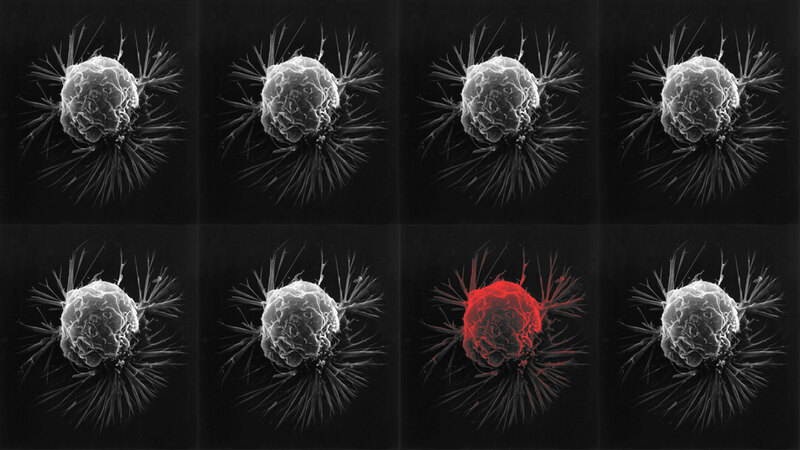 The work from de Keizer’s lab, however, offers the hope of reversing age-related damage. His approach stems from exploring the role of senescent cells. Until 2001, these cells were not really on the radar of researchers who study ageing. They were considered part of a protective mechanism that mothballs damaged cells, preventing them from ever multiplying into cancer cells. The classic example of senescent cells is a mole. These pigmented skin cells have incurred DNA damage, usually triggering dangerous cancer-causing genes. To keep them out of action, the cells are shut down. If humans lived only the 50-year lifespan they were designed for, there’d be no problem. But because we exceed our use-by date, senescent cells end up doing harm. 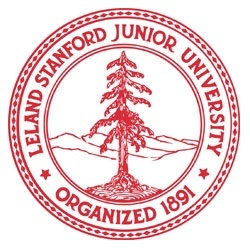 As Judith Campisi at the Buck Institute, California, showed in 2001, they secrete inflammatory factors that appear to age the tissues around them. But cells have another option. They can self-destruct in a process dubbed apoptosis. It’s quick and clean, and there are no nasty compounds to deal with. So what relegates some cells to one fate over another? That’s the question Peter de Keizer set out to solve when he did a post-doc in Campisi’s lab back in 2009. Finding the answer didn’t take all that long. A crucial protein called p53 was known to give the order for the coup de grace. But sometimes it showed clemency, relegating the cell to senesce instead. De Keizer used sensitive new techniques to identify that in senescent cells, it was a protein called FOXO4 that tackled p53, preventing it from giving the execution order. The solution was to interfere with this liaison. But it’s not easy to wedge proteins apart; not something that small diffusible molecules – the kind that make great drugs – can do. De Keizer, who admits to “being stubborn” was undaunted. He began developing a protein fragment that might act as a wedge. It resembled part of the normal FOXO4 protein, but instead of being built from normal L- amino acids it was built from D-amino acids. It proved to be a very powerful wedge. Meanwhile other researchers were beginning to show that executing senescent cells was indeed a powerful anti-ageing strategy. For instance, a group from the Mayo Clinic last year showed that mice genetically engineered to destroy 50-70% of their senescent cells in response to a drug experienced a greater “health span”. Compared to their peers they were more lively and showed less damage to their kidney and heart muscle. Their average lifespan was also boosted by 20%. But humans are not likely to undergo mass genetic engineering. To achieve similar benefits requires a drug that works on its own. Now de Keizer’s peptide looks like it could be the answer. As the paper in Cell shows, in aged mice, three injections of the peptide per week had dramatic effects. After three weeks, the aged balding mice regrew hair and showed improvements to kidney function. And while untreated aged mice could be left to flop onto the lab bench while the technician went for coffee, treated mice would scurry away. “It’s remarkable. it’s the best result I’ve seen in age reversal,” says Sinclair of his erstwhile competitor’s paper. Dollops of scepticism are healthy when it comes to claims of a fountain of youth – even de Keizer admits his work “sounds too good to be true”. Nevertheless some wary experts are impressed. “It raises my optimism that in our lifetime we will see treatments that can ameliorate multiple age-related diseases”, says Campisi.